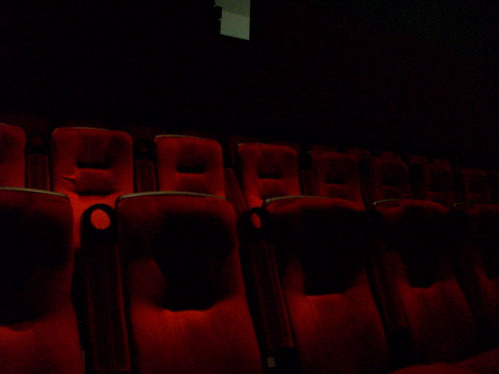 Not for nothing does David Lynch’s film Mulholland Drive begin with a collision. Living even on an unfamous appendage of this infamous mountain road means near-daily witness to mayhem. 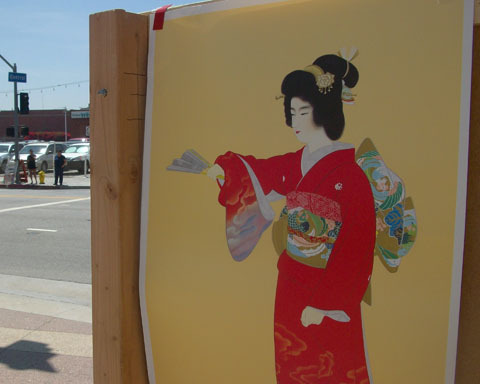 See, for instance, this post about a recent meet n greet not many yards from NiceWork Central. 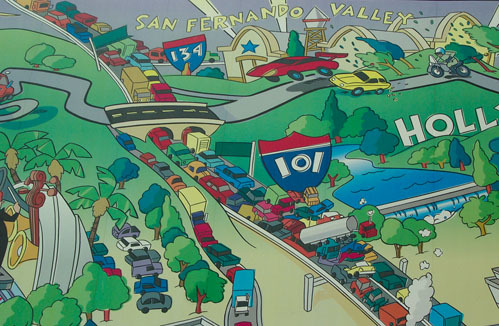 Los Angeles drivers are better at driving supersonically than in turning adroitly or stopping in a timely manner. 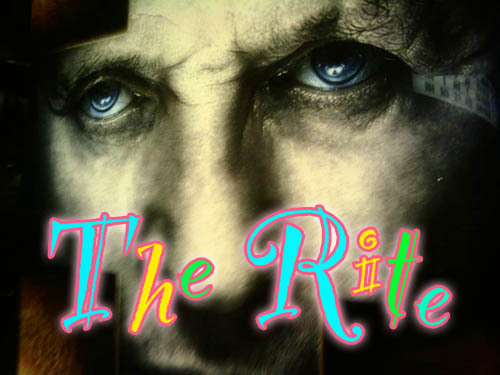 Corruscating puddles of broken Safe-T-Glass guide the Mulholland Drive traveller on moonlit nights. 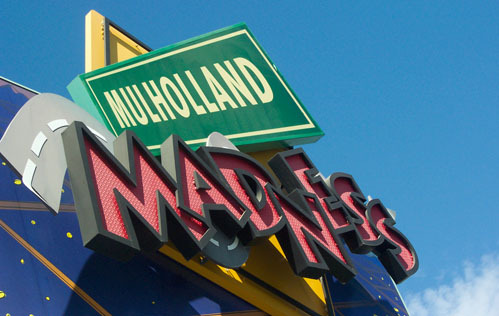 So imagine NiceWork‘s chagrin upon learning of the planned closing in October of Disney California Adventure‘s roller coaster Mulholland Madness. It must be demolished to make way for restaurants. We cancelled all our appointments and high-tailed it to Anaheim to grab one last snapshot of the venerable ride. 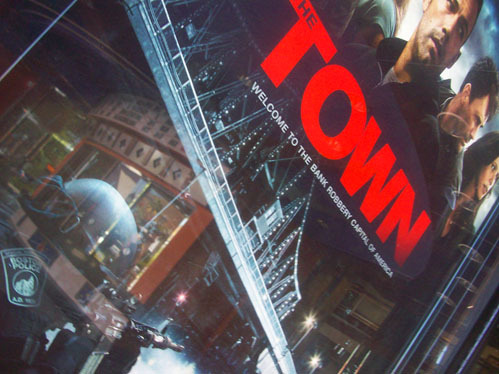 You see a photo of the attraction’s signage atop this post. And below you see one of the series of panels of a monumental mural which conceal the roller coaster’s maze of tracks from curious passers-by. Oh, well. Ars longa, right? 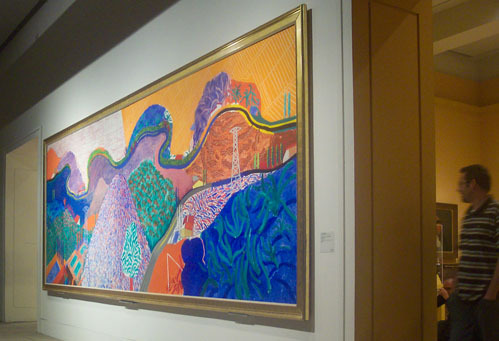 The painting endures — at least it was still at LACMA last time I looked — but the thrill ride soon passes into dull memory. Wave at the thrilled thrill-seekers one last time before Mulholland Madness hits that Final Speed Bump. 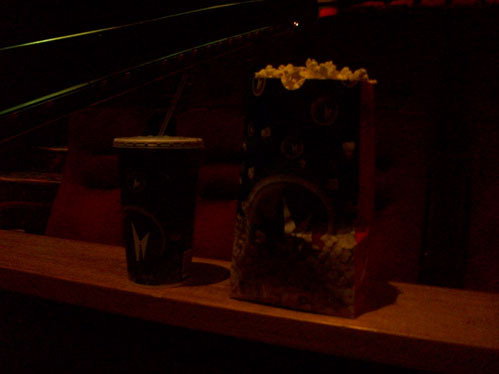 Posted in Amusements, Entertainment, L.A.
Where did you and the entire family go on Friday? I went with the entire family to Disneyland in Anaheim, California. How wonderful! 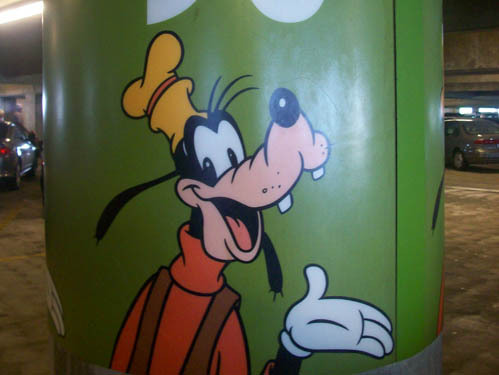 Did you see Goofy? Yes. He marked the floor where we parked. Did you see Mickey Mouse? Yes. 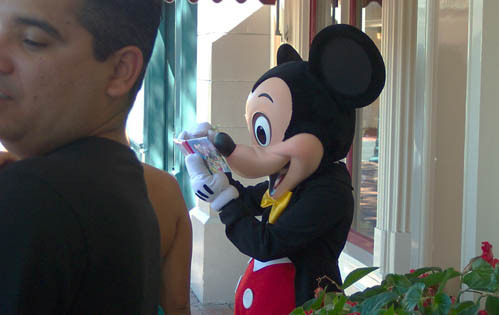 He signed autographs on Main Street. Where was Minnie Mouse? Was MINNIE there, too? 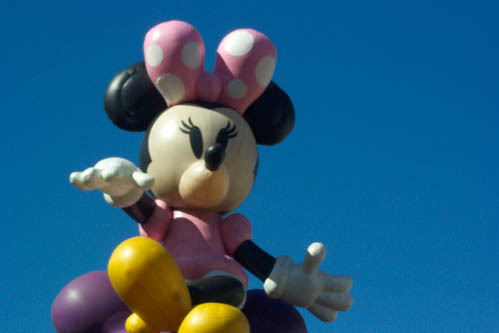 Minnie appeared in her balloon form. What about Donald? Donald Duck, I mean. I know who you meant, of course. Yes, Donald was there in multiplicity. 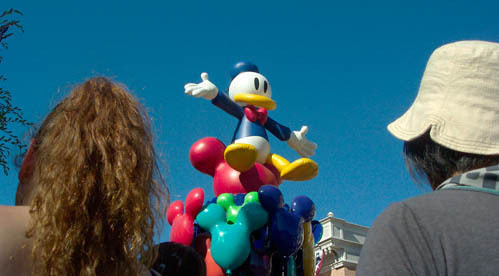 Here an inflated Donald stretches his arms as if to embrace the throng of parade goers. There seem to be many forms of each of the Disney characters. 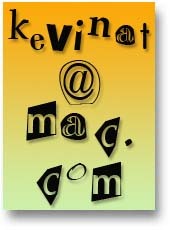 Was there a flower arrangement depicting the head of Mickey Mouse? 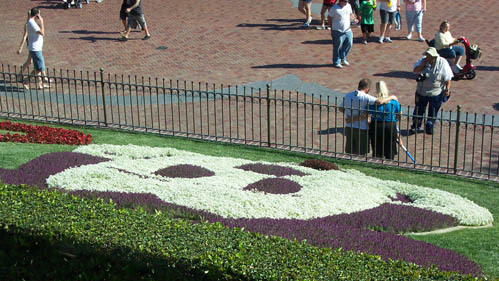 Right as you enter Disneyland the great floral Mickey Face welcomes you. WERE there any images of Mickey Mouse that A PERSON can consume? Oh, there are many edible items. 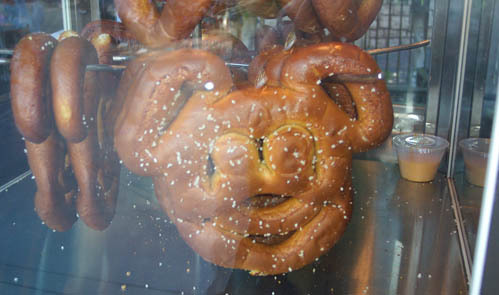 For instance, you can eat a pretzel shaped like the head of Mickey Mouse. Looks good, but it WAS QUITE hot FRIDAY. DID THE PARK OFFER anything colder? Oh, sure. 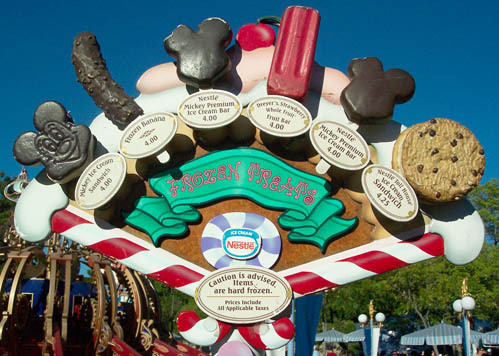 You can eat all manner of frozen Mickey heads. 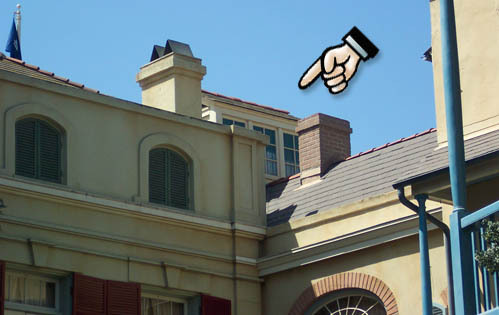 Did you find the place in Disneyland where you wish you could live? Right there. Above New Orleans. Posted in Amusements, Dining, Entertainment, L.A.
We meant only to check out an Asian grocery called Marukai Market in Los Angeles’s Little Tokyo — we were in search of an pan — but by chance we arrived at the kick-off of Nisei Week, a festival of music, prizes, colors, crowds, shabu shabu, and whatever Japanese stuff you can think of. In the photo above you see tanabata decorations, marking the one time of year when the star-crossed lovers Hikoboshi (the star Altair) and Orihime (the star Vega) are ferried over the Milky Way to be together. Yes, there were plenty of young Japanese girls dressed in semi-Harajuku fashion, but that’s not what you see in the picture above. These kids are posing as anime characters, we know not which. 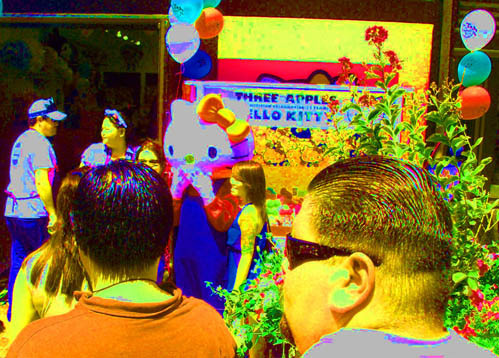 Hello Kitty was there, too, celebrating Sanrio’s 50th anniversary, but our photos of Hello didn’t turn out. The deliciousness and variety of the food aromas drove us nigh unto madness. We opted for Korean BBQ in the spirit of diversity within diversity. Power Ranger episodes from the early 90s entertained us while we snarfed. 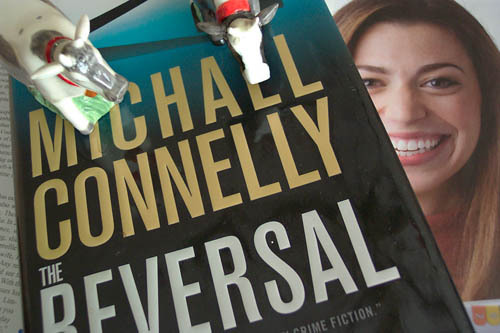 We dropped over a hundred at the wonderful Kinokuniya Bookstore without even trying; indeed, with much restraint. Then we toddled downstairs to the original goal of the journey, the Marukai grocery store, where we loaded up on Pocky and bean cakes. Then wearily home, with the siren song of geishas pleading with us to return, a temptation to which we will succumb before Hikoboshi and Orihime next cross the Milky Way. I fully expect a trip to the grocery store to provide a sensory shock or two — the vintage Cap’n Crunch boxes currently on sale for instance — but what could have prepared me for this month’s eye-popping cover of O, the Oprah Magazine? 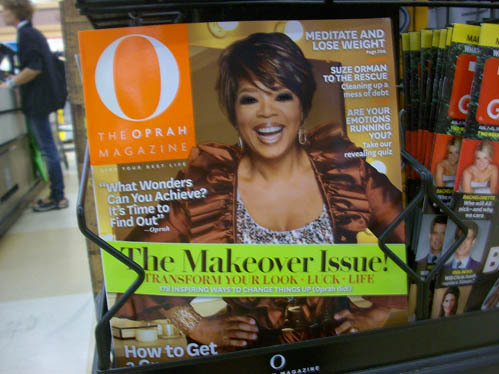 A banner proclaims “The Makeover Issue!” but I would have thought a makeover entailed only a new do, fancy clothes, face paint and a recharged attitude, not the blunking out of one’s eyes as Oprah appears to have undergone. Why, oh why would she go to such an extreme? Don’t tell me it’s a “new look.” Oprah’s days of looking are no more. Even tattoos are more reversible than eyeball removal. Lieutenant Commander Geordi La Forge’s seeing eye glasses lie far in the future. 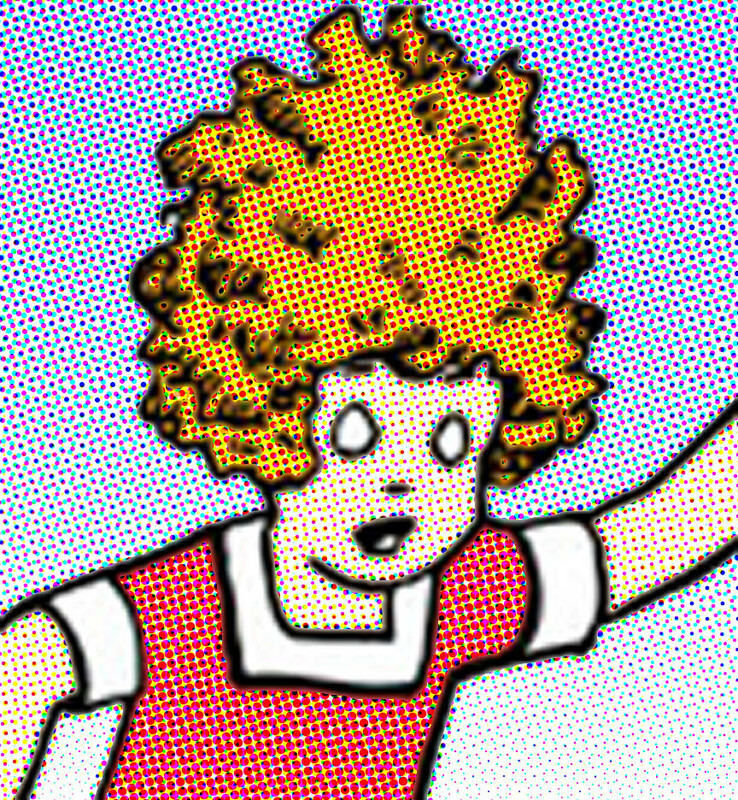 Is Oprah, in these hard times, referencing Lil Orphan Annie, the eyeless Depression era comic strip heroine? If so, big empty white circles — cucumber slices, perhaps, or spray-painted monocles — would work better than hideous cavernous sockets, and would leave her options open when further fashion developments dictate, say, a bug-eyed Marty Feldman thing. Is she making a Sophoclean statement? Does O now stand for Oedipus? 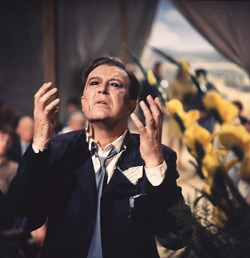 Are we meant to think of the final shot of Ray Milland in X, the Man With the X-ray Eyes? Or of Victor Mature in Samson and Delilah? We can only hope Oprah’s many fans don’t follow her blindly.